Good things come in pairs, so a little after the recent publication of a paper on the Y chromosomes of Afghanistan, there is yet another paper on the same topic. 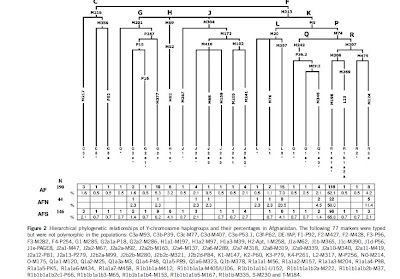 There is some quite useful information in the open access supplementary material, including a table of haplogroup R-M198 and R-M198*(xM458) frequencies in a wide range of human populations. Unfortunately, this paper too was probably written before the current developments in the R1a world, and did not take advantage of the newer discovered SNPs. Hopefully the DNA samples can be eventually tested in more phylogenetic detail. Central Asia has served as a corridor for human migrations providing trading routes since ancient times. It has functioned as a conduit connecting Europe and the Middle East with South Asia and far Eastern civilizations. Therefore, the study of populations in this region is essential for a comprehensive understanding of early human dispersal on the Eurasian continent. Although Y- chromosome distributions in Central Asia have been widely surveyed, present-day Afghanistan remains poorly characterized genetically. The present study addresses this lacuna by analyzing 190 Pathan males from Afghanistan using high-resolution Y-chromosome binary markers. 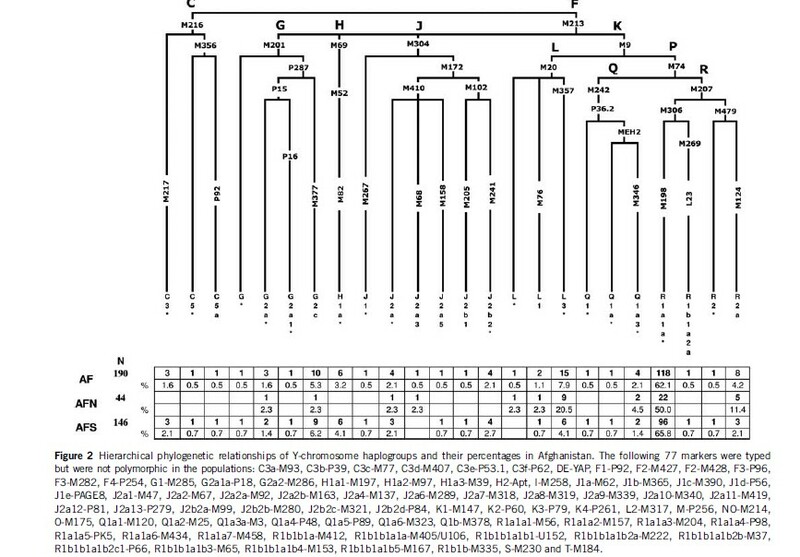 In addition, haplotype diversity for its most common lineages (haplogroups R1a1a*-M198 and L3-M357) was estimated using a set of 15 Y-specific STR loci. The observed haplogroup distribution suggests some degree of genetic isolation of the northern population, likely due to the Hindu Kush mountain range separating it from the southern Afghans who have had greater contact with neighboring Pathans from Pakistan and migrations from the Indian subcontinent. Our study demonstrates genetic similarities between Pathans from Afghanistan and Pakistan, both of which are characterized by the predominance of haplogroup R1a1a*-M198 (>50%) and the sharing of the same modal haplotype. Furthermore, the high frequencies of R1a1a-M198 and the presence of G2c-M377 chromosomes in Pathans might represent phylogenetic signals from Khazars, a common link between Pathans and Ashkenazi groups, whereas the absence of E1b1b1a2-V13 lineage does not support their professed Greek ancestry. What is Haplogroup R2? Where are R2 from and which country contains that? Which ancient population contains that? interesting how they draw a border directly through the center of the pashtun ethnic population and then use the objective quote "kill militants who cross the border to fight in afganistan". "What is Haplogroup R2? Where are R2 from and which country contains that? Which ancient population contains that?" R2 can be found in countries like India and Pakistan. The paper postulates a link to Ashkenazi because of G2c sharing but Hap G has also been found in Southern India Brahmin populations. It was here or on Gene Expression, that it was postulated that Hap G was absorbed by Indo Aryans before they entered the SubContinent. Afghanistan has seen countless invaders and diverse groups would have assimilated into Pashtun society, and Pashtuns reputedly have a tradition of accepting foreigners seeking protection. The paper appears to put some stock into the supposed Jewish origins of Pashtuns? If so, this theory is far fethched because Pashtun culure is quite different from Jewish. Haplogroup G in South Indian Brahmins currently typed, is all of the G2a variety instead of G2c. Thanks for informations. I think R2common ancestor really lived 25ky ago because his sister clade R1 was born 25ky. Their common ancestor R, was born 28ky. It can be happend among 28ky and 25ky! First R2 lived in somewhere soutern Central asia. Y-dna G for brahmins? Well guys the main ydna for brahmins are R1a1 and R2a with some H.
Nirjhar, Y-DNA G2a till date has only been found in South Indian Brahmins. There have been some reports of scattered finding in Bihari Paswans, but not conclusive.